By Paula Bowden | December 7, 2018. The talented students of EVE Tuiscint recently showed some of their art at an exhibition held at Ballyfermot Library. EVE is a HSE-run programme that provides community-based programmes for adults who experience mental health difficulties, intellectual difficulties, Asperger’s Syndrome, and physical and sensory disabilities. EVE operates a number of clubhouse services in 21 different locations, one of which is EVE Tuiscint located in Inchicore, which focuses on people with a diagnosis of Aspergers or ‘high-functioning autism’. The exhibition was created by the EVE Tuiscint art group with the aim of raising awareness around autism and included individual pieces from many students as well as two large watercolour paintings of the Northern Lights which were impressively created as part of a group collaboration. The exhibition was well attended by friends, family and art lovers alike and received rave reviews. The exhibition was also supported by other HSE EVE centres, including Phoenix Clubhouse, Cairdeas Clubhouse, Conai Clubhouse and Goirtín Hub. One of the budding artists among the bunch is Aaron Donohoe. Aaron has been attending EVE Tuiscint for the last year and through the programme he has been able to express his passion and talent for art and fashion design, turning the art room in EVE Tuiscint into a second home. ‘Art is a way I can tell the audience a story, and let them know about how I feel without using words,’ says Aaron who dabbles in a couple of different artistic mediums but says he loves fashion design and painting the most. For Aaron, it takes him less than a day to create a piece of art and usually a couple of days to create one of his fashion pieces which he makes from household goods and junk items like rolled up paper, wire and bits of fabric. 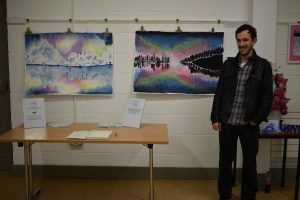 The talented artist has already been accepted to Inchicore College of Further Education and hopes to begin pursuing his passion next year by studying art and fashion design. And what does Aaron hope to do after college? “Fashion designer” he says obviously.